In today’s NYT, Paul Krugman highlights the subsidy being given to the ‘fracking’ methods of fossil fuel extraction: basically, another example where costs are socialized although, let’s face it, the most common example. The story of an old technology using non-market means to keep itself afloat is, of course, the way things work. (Just travel back to 1845 for this amusing parody from the French Paul Krugman of that day). What interested me more was the growing evidence that solar energy might be subject to a Moore’s Law rate of improvement. According to Ramez Naam in Scientific American, the cost of solar photovoltaic models has been falling at an exponential rate since 1980. Installation costs have been falling too. So much so, in fact, that in a decade, solar would outperform the average kilowatt energy cost in the US. A decade after that and it will be approaching the cheap baseload fuels. It is instructive to think about what this means given our experience with Moore’s Law in computing. First, environmental policy has two targets. The first is to change behaviour so that less fossil fuel is used. This can occur through a price effect (increasing the price of fossil fuel) but also through various standards to reduce consumption directly. Economists favour the former because of scepticism that we know how to efficiently do the latter. But given the predominance of fossil fuel usage, what we are talking about in either case is generally energy conservation: that is, we want less energy to be consumed. The second target is innovation. We want to encourage innovations that make it less costly (from an environmental perspective) to use energy. One class of innovations comes from energy conservation per se: getting more out of our fossil fuels — that is what your Prius is doing. The second class involves allowing energy to be produced without fossil fuels. And that is where solar comes in. As I point out in a paper forthcoming in the American Economic Journal: Economic Policy, the two targets of environmental policy can conflict. First, if we push towards energy conservation in behaviour, innovations that encourage energy conservation are less valuable — that is, if you produce a technology that allows you to save $$ per KW on your electricity bill, your returns are higher when consumers are consuming more electricity. If environmental policy gets that reduction first, the returns to innovation may go down. Second, the same can be true for general energy conservation and so may even effect alternative energy technologies like solar. The conclusion in the paper is that even if we are vigilant in environmental policy (such as establishing a carbon price) then we need to be additionally vigilant in technology policy to support it. But Moore’s Law in solar may be doing the job for us. In computing, betting on Moore’s Law means changing your usage to appreciate that processing power and storage will be cheap. All of the major innovators in the space for the last four decades have been successful by betting on Moore’s Law. That’s why your Gmail had so much storage and that is why all and sundry are investing in cloud computing. They are all bets on Moore’s Law type effects across the industry. And in each case, they are anti-conservation of what previously was a scarce resource or a bottleneck. Now, don’t get me wrong. I am not arguing that this is a good or satisfying conclusion. I was uncomfortable reaching it in my research but the basic economics was very clear. Moreover, two more decades of blindly polluting activity is two decades too much. Finally, missing an opportunity to conserve energy may only be delaying a future problem and also locking in infrastructure that is poorly equipped to take advantage of solar. But we have to step back and think about what these trends really mean. In that stark reality, one wonders if efforts for current conservation might be misplaced and instead that it may be time to bet on Moore’s Law in solar. Of course in this case only the cost/efficiency of recovering the energy can keep falling but there are hard limits there. The solar panels can’t get cheaper than free, and you can’t recover more solar energy than actually hits the earth per square foot. Glad to read this. But what about the improvements in efficiency in other generation methods? Independent of input cost, I’d have thought we see similar decreases of energy production using coal, gas etc? It’s somewhat funny to read paeans to that green holy grail, solar energy, and how it’s the white knight of capitalism against the ungodly dark forces of subsiding old energy sources… in the weeks after the Solyandra scam first burst. The Krugman article notes that Solyndra went out of business because its competitors were able to make _cheaper_ solar panels. That fits right in with the story of this blog post. The hitch is that it was obvious Solyndra was going out of business and it was predicted to the exact month. Krugman is a huge cheerleader for green energy subsidies, who’s rational for them contradicts his own economics textbooks. To have a prosperous society, free markets must be allowed to flourish where there are both winners and losses, profit AND loss. When the government chooses winners and losers the cream no longer floats to the top, it is who is better connected politically. Personally I want companies trying to convince me to give them my money by innovating instead of hiring lobbyists to influence those in power. And for those of you who wonder why we are still over 9% in unemployment 3 years into Obama’s progressive presidency: That is one of many answers. The problem is that the original goal — decreasing energy use — is an immoral, anti-human goal propped up by the eco-jihadi ruling class. It’s a religious idea base on some stupid earth cult idea of purity, not one based on a desire to improve human well-being. Figuring out how best to prevent humanity from using energy is like figuring how best to blind or maim people, it’s an malevolent goal. the costs are falling but compared to what? 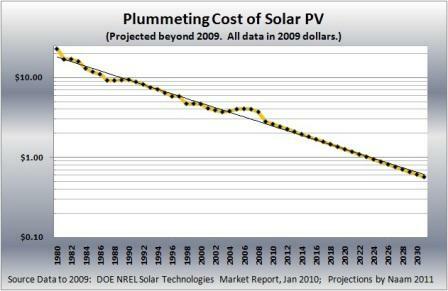 Note that the price of solar (just like semiconductors) is dropping due to a learning curve. It is not given, and requires increasing dollars and increasing sales and increasing experienced labor – for solar that may mean expanding solar installation job until it pays no more than someone who shingles roofs). Many of these factors are not variables with time, but rather variables with higher sensitivity to VOLUME –> accelerated by increasing installations (assuming supply/demand balance)- Germany which has the highest penetration of solar ALSO has the lowest costs for total installation (before subsidies). His final point is well taken too,- need to prepare- building out capacity of gas plants would be bad idea if the economics to run them won’t be there in 10 years. First, criticism. There is a huge difference between 7% per year and doubling every 18 months. Improvements in efficiency with volume are completely standard, though usually expressed in terms of volume manufactured rather than time. The amazing thing about Moore’s law is the rate, and as such, conflating that with what is happening in solar is sloppy. Second, serious question. Why do you see behaviour change and innovation as goals in themselves? Why not just take the goal to be reduced environmental impact and let the balance between technology and behaviour arise from market tradeoffs? Maybe that market includes some mechanism like a carbon tax to internalise externalities, but worrying that excessive conservation might reduce the rewards to new tech rather seems to miss the point. Well, did solar panel prices fall because manufacturing technology was so much more whiz-bang than two years ago, or because Chinese subsidized factories plus a global recession led to a supply glut? Oil was at $140 in 2008,and is now around $90 – is that due to technological improvements in extraction technology, or recession? 1) Even after solar crosses below coal and natural gas in cost for electricity, it will take decades for it to become a majority of the market. While cost parity is likely ~10 years away, solar dominance is more likely to be 30-40 years away. That increases the value of investments in reduced consumption now. Pingback: Overcoming Bias : When See Solar? Comparing Krugman to Bastiat is a huge insult to Bastiat who’s principles and understanding of economics never was second to a reactionary ideology. Just sayin’. Those in the know would tune out after reading that sentence.